The backyard is still covered in a glassy layer of snow, but the crocuses and tulips have started to pop out from the cold earth. 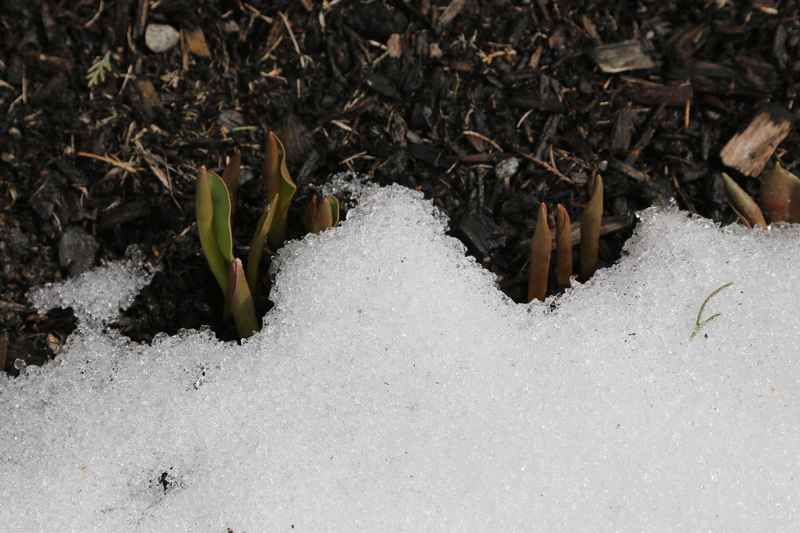 Winter still has a firm grip on upstate New York despite the fact that the first official day of spring has come and gone. I’m hoping winter releases us soon, because I am ready for warmth and color. More specifically, I’m ready to plant my new veggie garden. Once the snow has melted, I will tend to the dirt and prepare it for planting. Depending on the weather, I will be able to direct sow some things in April. Hopefully. Last year, my garden consisted of jalapenos, green and red bell peppers, carrots, peas, cauliflower and a variety of herbs. This year I plan to utilize my second garden more and move my sunflowers to the front yard. Between these items, my CSA farm share, and pickings from the fruit farm next door, I will have PLENTY fresh fruits and vegetables. Many of which will be organic. And something else? Maybe zucchini? Spring Awakening…. two years later! It feels like forever since I posted a blog entry. Oh wait. It HAS been forever. Like two years! My bad… We’ve been busy, I swear. Okay, I’ll admit it’s pretty lame that I’m a writing teacher, yet I never write. So, here I go! Oh, I’ve got an idea! I’ll talk about my garden. One of last year’s sunflowers. Last year I had Nick construct two above-ground gardens in our back yard: one made with organic materials and the other made with regular materials. I also used some small planters, and one bricked garden to grow our loot. We successfully grew bell peppers, jalapenos, spicy peppers, blueberries, Italian parsley, carrots, broccoli, basil, mint, lavender, chives, oregano, and sunflowers. Cucumbers and squash were also planted, but they failed miserably. The broccoli also gave me problems: it attracted a variety of pests and did not like the hot, sunny days we experienced. I was most successful with the herbs and the peppers. In fact, I had more bell peppers (green and red) and spicy peppers than I knew what to do with! We’ve seen some sunny, warm days since we planted these in our organic box, but we’ve also seen some very cold days. Today I took a look at the progress of our plants and seeds. The spinach and peas have sprung, our cauliflower isn’t dead, and our carrots are still hiding (as expected). Last year the carrots took many weeks before making an appearance. I also noted that the mint has sprung…. ALL OVER! It’s like a weed! It’s growing in new places, even. My chives have also come back and are standing tall. We are still undecided what else to grow. Xander wants to grow pumpkins. I want to grow peppers. Nick doesn’t care. So, we shall see. Profusely growing mint. Mojitos anyone??? I spy a baby bean plant! Spring is in the air… so Xander & I went flower hunting. Daffodils are beginning to open and forsythia bushes are profusely blooming. Here are some highlights from our spring morning. mommy & son shadows. we are ready to flower hunt! one of Xander's newest words is 'sky.' i think it's because he loves anythinig blue. and boy, the sky is blue today. xander says "have a happy weekend!" Today is March 15 and the nearby garden center, forthegarden.net, is opening for the 2008 season! They have beautiful purple, yellow and white pansies out on display. Spring is nearly here. The trees have swollen buds, my bulbs have green stalks standing a couple inches from the ground, and the days are slowly getting wetter and warmer. I think April showers are upon us already. Right now it’s 47 degrees, windy, and drizzling– Typical spring weather for Saint Louis. Yesterday Xander and I went out in the back yard to play where I snapped a photo of the ‘first sign of spring’ in the Mills’s yard and captured a video of Xander walking (he’s really getting the hang of it now!). Have a great weekend everyone! I’ll post a new blog later about Xander’s 12 month checkup.